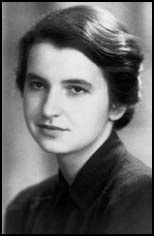 Franklin is best known for her work on the X-ray diffraction images of DNA which led to discovery of DNA double helix. Her data, according to Francis Crick, was "the data we actually used" to formulate Crick and Watson's 1953 hypothesis regarding the structure of DNA. Franklin's X-ray diffraction image confirming the helical structure of DNA were shown to Watson without her approval or knowledge. Though this image and her accurate interpretation of the data provided valuable insight into the DNA structure, Franklin's scientific contributions to the discovery of the double helix are often overlooked. Unpublished drafts of her papers (written just as she was arranging to leave King's College London) show that she had independently determined the overall B-form of the DNA helix and the location of the phosphate groups on the outside of the structure. However, her work was published third, in the series of three DNA Nature articles, led by the paper of Watson and Crick which only hinted at her contribution to their hypothesis. After finishing her portion of the DNA work, Franklin led pioneering work on the tobacco mosaic and polio viruses. She died in 1958 at the age of 37 from complications arising from ovarian cancer. - from Wikipedia. For the entire entry click here.